**** If you want all beads to be 6mm, please add a note to seller. **** Metal spacers may somewhat vary but they will be similar to the ones in the picture. If you wish to see the exact ones currently available, kindly message me before purchasing. - Stretch Bracelet: silver tone metal spacers on a stretch cord. - LobsterClaspBracelet: silver tone metal components on flexible metal wire. - Sterling S. Stretch: sterling silver metal spacers on a stretch cord. - Sterling S. Clasp: sterling silver metal components and clasp on flexible metal wire. Please be advised that all metals tarnish (especially when in contact of the natural moisture in the human body as well as moisture in the atmosphere) but Sterling Silver can be cleaned using your preferred method. Bracelets ordered with any of the sterling silver finishes are subject to 1-3 extra days for processing as we keep a small quantity of these metal components in stock. 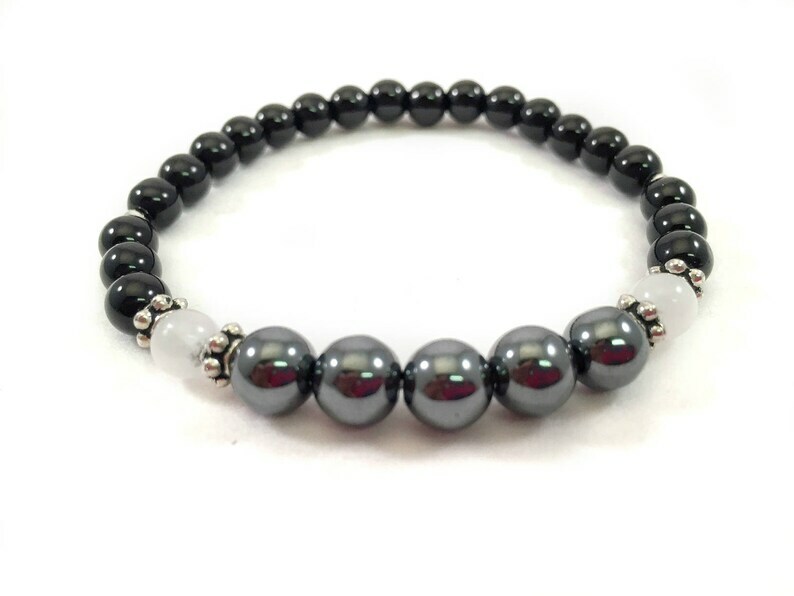 Fantastic and beautiful energy protection bracelet! This bracelet has wonderful energy and is so beautiful! It arrived very quickly and so nicely packaged. It is far prettier than the photo even. I have worn it since it arrived. Thank you Yeli! I will definitely be back to your shop! I highly recommend Serenity by Yeli! I'm a hypnotherapist who helps many people heal from many things. I have been working with a client who has been carrying some heavy negative energy that was attracting some very negative spirit attachments. I was able to release these spirit attachments sending them to where they needed to go (they always need the light and the help of other loving beings to further their journey). Through further secessions, we were able to bring back the positive energy and their love of living. I decided to incorporate Yeli's protection bracelet into my program as a new technique. My client loved Yeli's "gift" presentation, the looks/ design and felt an immediate comfort from within wearing the bracelet. Very rich in color! It’s my new protection piece I wouldn’t go anywhere without it. She truly does stand by all her work and I will continue to be a VIP customer with her. I love the black and whitw stones combined. Just gorgeous.